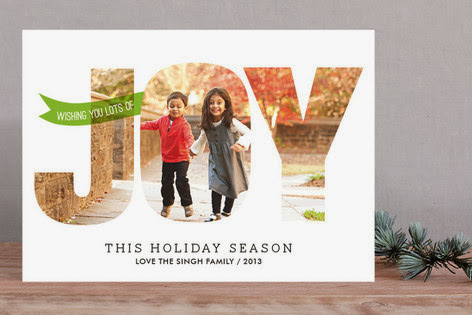 This post was written by me on behalf of Minted.com. I have received compensation for this post, however, all opinions are mine. One of the tasks I dread most about the holidays, is sending out cards. I spend so much time looking at cards before I decide what I want to use. I gather my addresses, label the cards...and decide to go to the post office the next day. And the next day. Or the day after that. Basically, I never really ever make it to the post office. I have stacks of signed and addressed cards from several years that never made it to the recipients. For some reason, I never seem to be able to complete the Christmas card task. I have to wonder, though, if I found a really awesome photo card it would be different. Especially if I found a really different photo card. One that screamed The ADD Housewife Family! Minted.com has so many unique card designs beyond the standard top/bottom names in the solid colored area type cards. Not that there's anything bad with the basics. Don't get me wrong. I just really love unique ideas. And, my holiday heart is made even happier with their Address Assistant...where your cards arrived already addressed! The first card that caught my eye was this round card. I love the quote, too! 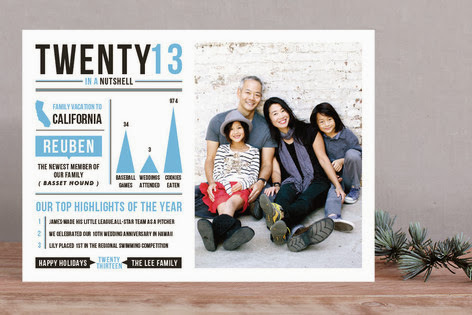 But, with all my kids...we're just not going to fit on a card like that. Or this one, even though it's so stinkin' cute! The one card that stopped me in my tracks and I fell instantly in love with is this one that kills two birds with one stone: The required Christmas card and the dreaded Christmas Letter. A card that would make my life a tiny bit simpler by not having to stuff a letter in with the card? WIN! So it's not a long Christmas letter, but it gets the point across. The year was awesome. The kids would all fit in the picture. Perfect! 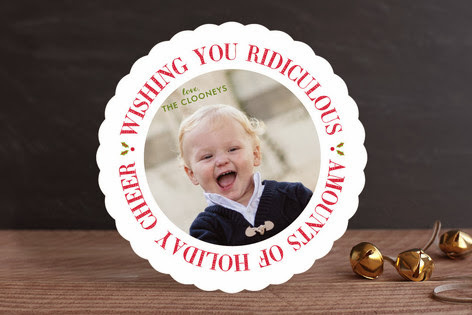 After I was done looking at the holiday cards, I decided to click around the rest of Minted and found that they do more than just cards. They also have customized art, stationery, and even photo backdrops. I was really impressed with the selection done by all of these independent artists and designers! I love their selection. I've been meaning to go on and order Christmas cards. Like you, it's the most dreaded chore of the season because I always put it off until it's too late. Hoping to change that this year. I gave up holiday cards years ago... such a struggle. I have no idea why? I am however always very impressed when I get a card from someone. I've never done the online ordering... I'm going to pop over and check it out, thanks!